1932 Near/Far 2? Anyone know how this works? Re: 1932 Near/Far 2? Anyone know how this works? 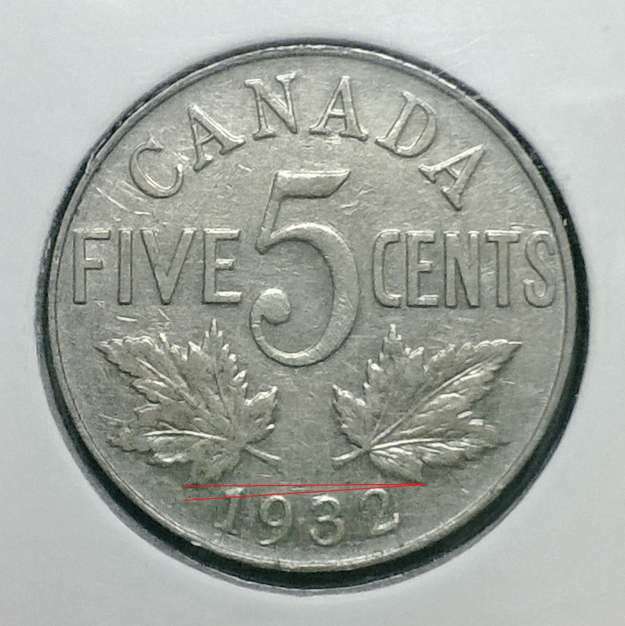 Update: There is now a great conversation going on over on Coin Community's Canada section regarding this very 'variety'. It appears we've uncovered that this may not be a black and white variety. Just a heads up. With a coin 5 cents 1932 Far 2, the 2 is near 3, near rim and far leaf. With a coin 5 cents 1932 Near 2, the 2 is far 3, far rim and near leaf. Following this, i am sure that your coin is a 5 cents 1932 Near 2. It is possible that the wear of this coin explain your doubt on this. Za.. Je crois maintenant qu'il n'y a pas seulement deux variétés. Je pense que maintenant il ya certainement 3 ou peut-être 4. Loose translation: After seeing so much posted about this coin over the past week, I now think there's 3 or possibly 4 varieties of the 1932. I wouldn't go selling the farm on the 'new' far 2 variety until further research is conducted. Clearly there's a difference, but I think there's way more out there (numerically) than we think. I'm not buying the 1%. Plus, again, I'm beginning to suspect multiple varieties. There's clearly three already, IMHO. I think the powers that be are trying to sell books, not do the hobby justice by insinuating it's a one or the other variety. Would be nice if I could see the coin without the lines. Yes, I think that the lines that are drawn just confuse the situation. Zonad's method of comparing the 3-2 gap with the gap width between the 2 and the leaf is a no-brainer and infinitely easier. Just a quick glance at the coin and you can tell ... no lines! I also think that the population/scarcity data has been fouled since this all began 2-3 years ago on multiple coin sites. I think that the incidence percentage is more than 1%, but far less than 10 .. still a scarce coin, but with alot of questions.